Life lessons are all around, because that’s life! 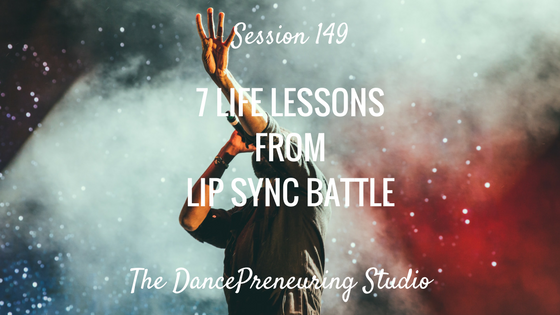 I share 7 life lessons that I was reminded of at a recent live taping of the popular show Lip Sync Battle. I am so thankful for the evening of entertainment, inspiration and education. Step to Success: A step to your success is anything that moves your life and your business forward. Whether it’s an app, a book or an idea, you can apply something today that can help you succeed. Today’s step to success is emptying your trash from your email accounts, from the trash and spam folders to clear up storage space. Dancer’s Dialect: The Dancer’s Dialect is the dancer’s language. I share dance terminology and concepts across different genres so you can see the correlations in your life and in your business. Today’s concept is being clear on where your focus is. Check out these two awesome artists that I’m so blessed to work with on Session #121. Freestyle Flow: I didn’t take the description “cocktail attire” very seriously for a recent live performance. But it turned out fine and more important lessons were learned as discussed in the Feature Presentation. 2. Assess what you might be taking too seriously or too casually in the different areas of your life. 3. Be early and allot more time for things to accommodate margin. 4. Honor and learn the history of the things and people that are important to you. 5. Be mindful that what you do can so profoundly impact someone else’s life, just as Michael Jackson did with his life and career. 6. Just as with this Lip Sync Battle event, there are competitions in life that are popularity contests, and that is the reality of it. However, it does not define you or your value. 7. Engage and enjoy the times you indulge in entertainment.